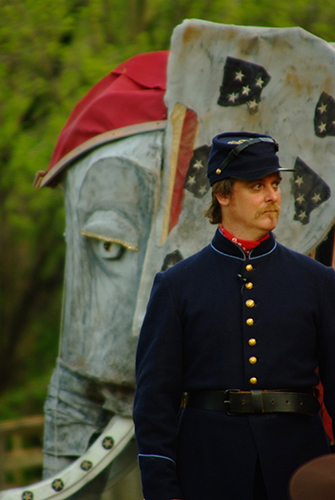 The Civil War/Cemetery Project, produced in conjunction with Moravian College, and in commemoration of the 150th anniversary of the American Civil War, led to a community-based play, written by Alison Carey playwright of Touchstone’s Steelbound. Titled A Resting Place, the show drew from the stories of individuals who lived and died in Bethlehem during the years of the War Between the States. More than 100 actors and support crew presented the play five times in different outdoor locations on Bethlehem’s North and South sides, over the three days in April of 2012—a gift to the community. The script was developed around Dan Rice, a traveling performer who was known for his wit and humor in the mid-1800s. He entertained people in both the North and South, changing his punch lines accordingly, and performed in Bethlehem during the Civil War with his traveling circus. Check out the process here.